Aspirations Theatre Academy is a new and exciting organisation committed to providing children with opportunities to learn about theatre in a fun and interactive way. We have a variety of courses on offer from acting or dancing to working on a complete stage show. All of our courses are designed to help children develop confidence and build self-esteem in a fun, safe and happy environment. This is followed with the rich reward of performing to a live audience in a real theatre, showing off the culmination of their hard work and efforts. At Aspirations we are aware that not all children enjoy being in the limelight and do not yet have the skills or confidence to perform to an audience. As such we offer courses where the children are able to develop acting skills, while interacting with others, without the added stress of a performance. 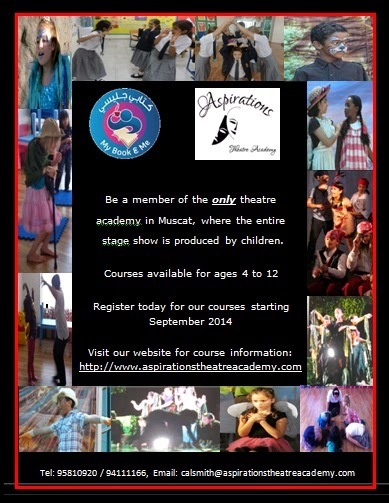 Aspirations Theatre Academy aspires to be the only theatre academy for children in Muscat, where the entire theatre stage show is produced by the children. We had great fun in August with The Story Teller. The children explored Jack and the Beanstalk where they discussed stealing and poverty. This lead to the creation of a brand new ending to the story. In addition the children helped the Gruffalo, who had no friends. The children advised him on how to change his appearance and behaviour so that he could make friends more easily. Join us for more Story Teller fun in September.